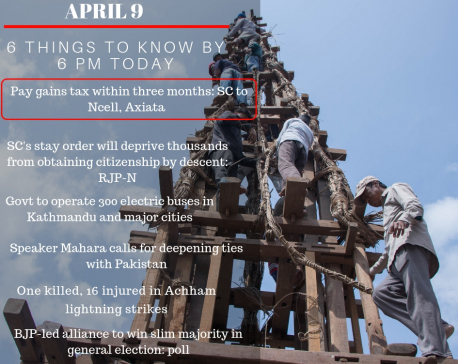 KATHMANDU, April 10: The Supreme Court on Tuesday ordered Ncell and Axiata Company to pay Capital Gains Taxes (CGT) amounting Rs 39 billion and its interest within three months. Releasing the full text of the verdict on the years-long tax dispute, the apex court, which had ordered that it was the responsibility of Ncell and Axiata to pay CGT in early February, gave a clear deadline to the companies to pay the tax due. The court has barred the telecommunication company from selling shares, distribution of bonus and company’s buyout until the tax and its interest is paid. The pending tax amount of Rs 60.71 billion was not cleared when Telia Sonera sold the company’s shares to Axiata in December 2015. Of that, Ncell had paid Rs 11.57 billion to the Large Tax Payers Office in June 2017 claiming that the company is not fully liable to pay the taxes once the company’s big share was sold out to a new company. Earlier, Axiata that bought 80 percent of the company’s shares from Telia Sonera had been claiming that it was Telia Sonera’s duty to pay the CGT. Stating that the court enjoys extraordinary authority to ‘settle the dispute’ and ‘provide necessary remedy’ to resolve the dispute, the court has concluded that tax offices concerned which are responsible for determining taxes didn’t rightly claim taxes from the telecommunication company while the company’s share was sold to Axiata. The court stated that Section 57 (1) of the Income Tax Act-2058 makes Ncell and the Axiata responsible for paying the CGT and not Telia Sonera. The court said Nepal government has not received taxes amounting Rs 39 billion due to lapses on the part of the tax officials. The office of the Attorney General has been asked to submit the court verdict to the defendant and execute the verdict. The controversy came to surface after the government, particularly the Department of Inland Revenue and its entity LTO, did not assess the tax and also issued conflicting statements on the matter. First the IRD remained silent on who was liable for paying the tax of the profits earned from the business and services generated from Nepal but after Telia Sonera, the Swedish company, went out of the country, top government officials including the then Prime Minister Pushpa Kamal Dahal stated that the seller is liable to pay the tax. This meant Ncell wasn’t responsible. Bishnu Paudel, Krishna Bahadur Mahara and Gyanendra Bahadur Karki became finance ministers in this period but neither they not the government heads settled the case properly. The Office of the Auditor General, in 2017, concluded that the profits earned from the buyout deal was taxable. This conclusion prompted concerns as to why the successive governments were not working sincerely to collect the tax from the companies concerned.